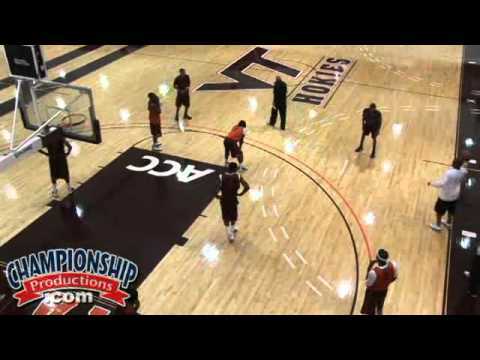 In this All-Access DVD, you will see the Hokies prepare for the 2010-11 season. 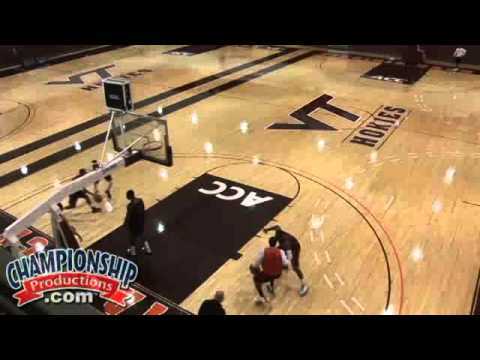 In these four practices Seth Greenberg stresses the importance of passing and catching to limit turnovers, closing out and staying disciplined on the defensive end, and teaching his players how to play basketball and not be robotic in their actions. Practices begin with a warm-up designed to reiterate proper fundamentals. Greenberg's Dribble Warm-Up Series puts an emphasis on the ball handler's ability to change speeds and direction. Players vary their moves on the way to the basket and work on different finishes both inside and outside of the paint. Expanding on being efficient with the basketball, six different passing drills are demonstrated in the half-court and in the full court. Coach Greenberg splits up perimeter and post players in each one of his practices to work on developing the skill set needed for his offense. Perimeter players work on playing off dribble penetration, making the extra pass, being shot ready, all while maintaining proper spacing. Post players work on scoring moves with their back to the basket, roll and replace action, and proper techniques of sealing in the post. Coach Greenberg's teams are known for playing aggressive, disciplined defense and he takes you through all of his drills that he uses to build his foundation. Learn how to guard game actions such as cross screens, flex screens, down screen and UCLA screens, as well as learning proper help and recover rotations, both from scramble and disadvantage situations. You will also learn how to guard different types of ball screens both in the half-court as well as out of transition. Relying on all-out effort, communication, and on-balanced close outs you will see what separates good defensive teams from great ones. Greenberg allows his players to play in a free-flowing manner without any set designed action. Each practice they work on their motion cuts and how to play off of the defense. Greenberg demonstrates multiple drills both in the 5-on-5 and in breakdown segments that will teach your players how to play off dribble penetration and the proper spacing necessary to both effective and efficient in your half-court motion offense. You will also see how Greenberg and his staff use multi-player drills in both their post and perimeter breakdown sessions to implement game shots and game reads within their motion offense. Within Greenberg's offense you not only see motion concepts, but also his slicing action and lots of flex concepts as well. 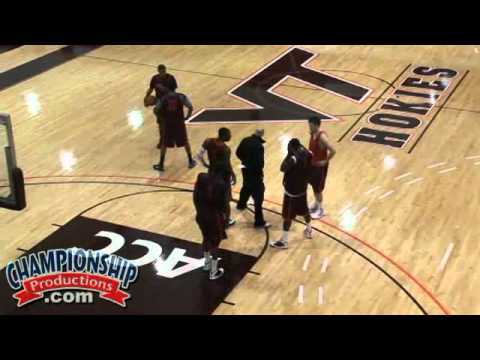 In these four practices the Hokies work on both their primary and secondary breaks. From building on their 5-on-0 "Speed Game" to 5-on-5 secondary breaks you will see how their offensive attack can work against any defense. From ball screens in transition to staggered screens off the break the defense is forced to guard every type of action. This DVD is a must have for any coaching library. Order now and receive quality offensive and defensive drills and plays that can be incorporated into any program! 619 minutes (5 Discs). 2011.